Designing an illustration and eventually transferring it to a T-shirt is a hobby currently being embraced by many. The designs often look fantastic after they are designed on a particular software. Consequently, the significance of the best heat transfer paper to be used is a matter that needs be taken seriously if at all you end results are to be ideal. Notably, whether the items to be decorated are personal or for friends’, the images need to withstand wash after wash. The quality of the design and print are even more demanding if the fabrics are shirts or other garments meant for sale since as a business you would love to get returning customers. Normally, getting the right best iron-on transfer paper is easy. However, this may prove to be overwhelming at the moment as the market is flooded with a variety of these papers. 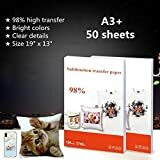 In the succeeding paragraphs, is a comprehensive guide on the best transfer paper. Why do you need an iron on transfer paper? Basically, as most of us are aware, heat transfer machine is used together with a heat press machine, such an iron. The heat transfer paper is made of a polymer film that creates a permanent image when printed onto. Consequently, this polymer film makes a permanent bond with the fibers of the fabric. Iron on transfer requires minimal equipment, unlike screen printing. They are fantastic for hobbyists, enabling you to explore and enjoy your hobby even further. They are inexpensive. Meaning with a limited budget, you could still possess, or gift friends envied designs. Iron on transfer is associated with clean transfers compared to screen printing. This makes iron-on transfer paper designs among the most reliable way of decorating your fabric. What makes the best iron on transfer paper? Compatibility with your printer - Currently, most iron-on transfer papers are made for inkjet printers. However, available are also laser and sublimation printer papers. When seeking an iron-on transfer paper, you ought to be aware of the type of your printer. Adhering to manufacturers recommendations are significant, for instance, using iron-on transfer paper meant for inkjet in a laser printer could be catastrophic. Primarily this would result in the paper melting all over your printer and repairing it could result in a massive bill or even replacing it. To be on the right track, keenly check the label before purchase to ascertain you have the right paper for your printer. Fabric/ material color - Besides establishing whether the paper is compatible with your printer, another vital factor to consider is the color of the fabric that you will be transferring your designs. At the moment most of the papers are widely made for white and light colored fabrics. Therefore, if you intend to transfer your image onto a white garment, you need a paper labeled for white color. It is significant that you seek a paper that is particularly made for your fabric, for you to achieve compelling results. The sheet-size- Usually, the sheet size depends on where you want to transfer your image onto. However, working on a longer transfer paper offers you more freedom, when creating your graphics or pictures to be transferred onto a shirt. Durability- laser and inkjet transfer papers can hardly be compared to fabric-based, sublimation, and cad-cut transfers. However, with inkjet papers coupled with correct transfer techniques, they tend to offer designs resistant to fading, cracks or peeling upon numerous washing. To appropriately evaluate durability, consider variables such as; wash and fade resistance, elasticity, hand feel, resistance to cracking, and color vibrancy. Cool-peel feature- notably a myriad of transfer papers need to be peeled off as soon as after ironing, with cool-peel backing papers, you can wait until the transfer cools before peeling. This will primarily prevent the earlier mention scorched fingertips. 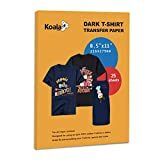 Affordability – the best t-shirt transfer paper needs to affordable. Look for papers that are fairly priced and therefore fit within your budget. Designing your favorite t-shirts designs ought not to be an expensive endeavor. Availability and reliability- the best iron on transfer paper for t-shirts need to be reliable in terms of the outcome. The end results should be a state of the art design on your garment. Some paper may feel somehow like plastic when transferred to your fabric while others are associated with scorched fingertips. Avoid such papers. 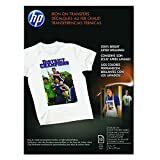 Additionally, ideal papers ought to be readily available, with numerous online stores currently finding the iron-on transfer paper is relatively easy. 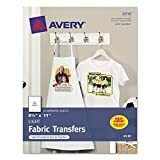 Avery Light T-shirt Transfers: This is designed particularly for inkjet printers and comes with six sheets to use in an inkjet printer. It is coupled with a color shield formula, meaning bright color remain bright even after use. Techni-print EPZ laser heat best, transfer paper: As the name suggests, the iron transfer paper meant for laser printers only. It easy to use and amazingly soft hand. It ranks among the best in transferring personalized photos and images to fabric. Epson Iron-on Cool Peel, best Transfer paper: It comes with 10 sheets measuring 8.5’ by 11 inches. From the name, it enables one to transfer peels off after cooling easily. It is particularly ideal for canvas bags, T-shirts, and much more. PrintWorks White T-shirt transfers: Although they are meant for white fabrics only, they are arguably among the best. The brand is specially made for inkjet printers. In a nutshell, as aforementioned, it is vital that you purchase an iron-on transfers paper coupled with specifics features. The specifications to be on the lookout for include; fabric and printer compatibility, durability, and color of your fabric. With these features on board, you can be certain that the end results will be a masterpiece. 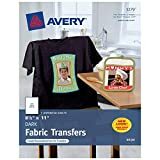 Thank you for reading through our review on best iron-on transfer paper. Be sure to visit our site nest next for more insightful content.